Notes: Blodwell Junction station was opened as Llanyblodwel by the Potteries, Shrewsbury & North Wales Railway (PS&NWR) on 18 April 1870. The station was situated on the PS&NWR Nantmawr branch, a 3¾-mile line that had opened on 13 August 1866. The Nantmawr branch provided a link between the Cambrian Railways (CR) line at Llanymynech and quarries at Nantmawr. The PS&NWR main line linked Shrewsbury to Llanymynech. The PS&NWR was not a financial success and it went into receivership in December 1866. Trains ceased to run on 21 December 1866. The receiver started to run train services again in December 1868 and on 18 April 1870 they introduced a passenger service onto the Nantmawr branch for the first time. The branch terminus for passenger trains was located 2 miles and 36 chains from Llanymynech at Llanyblodwel. The station was located ½ mile to the east of its village namesake on the west side of the Llanymynech road (present day A495) which passed over the line on a bridge. The branch was a single-track railway and the station was provided with a single platform on the north side of the line. It was constructed from brick, backfilled with earth and topped with cinders. A single-storey timber building located at the eastern end of the platform provided booking and waiting facilities. Run-around facilities were provided at the station. The branch continued northward from the station for a further 1 mile and 21 chains to its terminus at Nantmawr but only goods trains operated over that section. 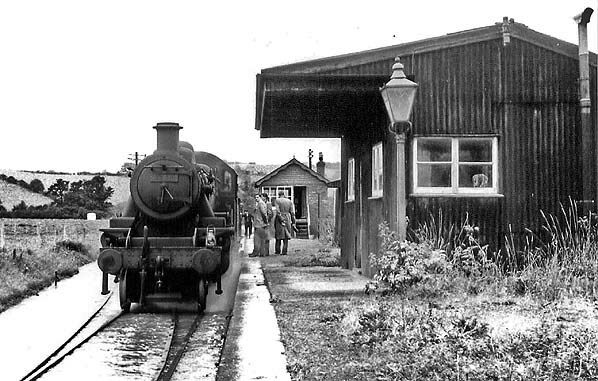 Passenger services ran between the station and Shrewsbury Abbey station via Llanymynech. The receiver could not make the PS&NWR line pay and it withdrew all train services on 22 June 1880. 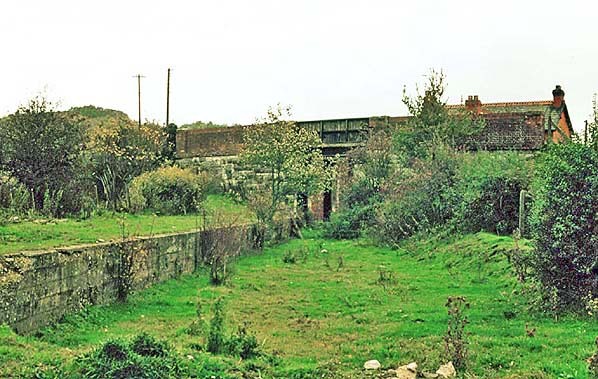 Llanyblodwel station was closed and fell into a state of dereliction. The main line between Llanymynech and Shrewsbury was abandoned but the quarry owners at Nantmawr wanted to move their stone out by rail. They approached the CR who agreed to work the line for mineral trains from 11 February 1881. During the second half of the nineteenth century there hadbeen various schemes to build a railway along the Tanat valley towards Llangynog, but none were successful until on 4 January 1899 the Tanat Valley Light Railway (TVLR) was authorised as a 15-mile standard gauge line. Construction started in July 1901. The TVLR route made use of two existing lines. At Llanyblodwel it used 19 chains of the Nantmawr branch through the site of the station. Further east it used 78 chains of the CR Porthywaen branch which connected to the CR main line at Llanclys. A section of line of 1 mile 21 chains was built from Llanyblodwel station to the Porthywaen branch and a further section of 13½ miles ran from the west of the station to Llangynog. The line was inspected in November 1902 and again in December 1903. During 1903 Llanyblodwel station was refurbished. A new platform face was constructed from timber and the building was altered. The station was renamed Blodwell Junction in recognition of the new situation that it found itself in. A running-in name board was provided to the east of the buildings. To control the junction a signal box was built at the south-west end of the platform. 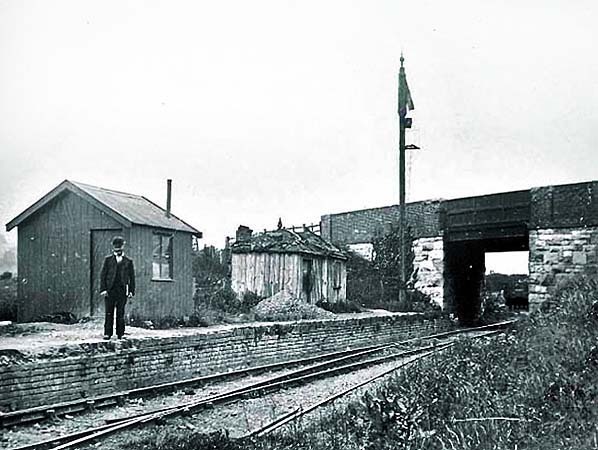 There were sidings at Blodwell Junction and the Railway Clearing House Handbook of Stations 1904 listed the station as being able to deal with goods and livestock. An opening ceremony was held on 5 January 1904 when a special train was run for directors and invited guests; public services began the next day. Train services were operated by the CR and ran between Oswestry and Llangynog via Llynclys Junction. By this time moves were afoot to resurrect the PS&NWR main line as the Shropshire & Montgomeryshire Light Railway (S&MLR). The fledgling company was concerned that it would be denied traffic because the TVLR trains bypassed Llanymynech running via Llanclys. To allay those fears a passenger service was introduced between Blodwell Junction and Llanymynech. The S&MLR did not obtain its light railway order until 11 February 1909 and the line did not reopen until 13 April 1911. In 1910 there were three trains to Llangynog and three to Oswestry on all days except Wednesday and Sunday. On Wednesday there were four up trains and on the first Wednesday of the month only there were four down services. No trains ran on Sunday. There were trains to Llanymynech at 10.55am and at 2.40pm and arrivals from there at 11.35am and 2.35pm on Monday-to-Saturday. The Llanymynech service was not a success and it ceased to run on 1 January 1917. In 1921 the TVLR was vested in the CR and a year later on 1 January 1922 the CR was absorbed into the Great Western Railway (GWR). The July 1922 timetable showed three services in each direction Monday-to-Saturday as seen in the table below. There was an extra up service on Wednesdays and an extra down train on the first Wednesday of every month. There were no trains on Sundays. In 1925 a section of the Nantmawr branch, between Blodwell Junction and Llanymynech closed. 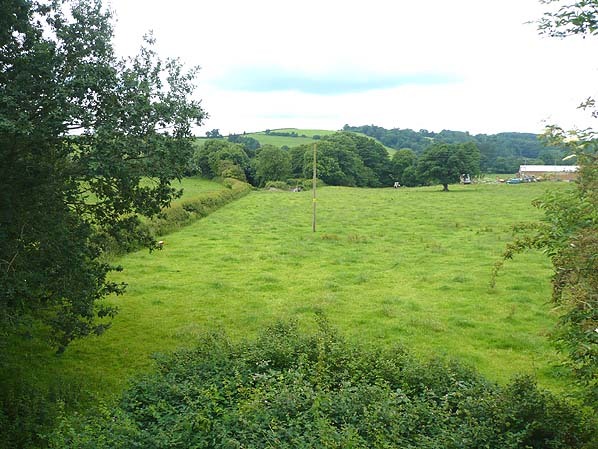 At Blodwell Junction a short section of the line was retained as a headshunt that stretched as far as the River Tanat. The redundant track had been lifted by 1938. During the Second World War the passenger service was reduced and additional buses were operated to serve the Tanat Valley. On 1 January 1948 Blodwell Junction became part of British Railways [Western Region] (BR[WR]). The BR[WR] timetable for the summer of 1949 showed only two trains in each direction on Monday-to-Saturday as seen in the table below. With such a limited service and heavy competition from local bus services passenger trains between Oswestry and Llangynog were withdrawn by BR[WR] on 15 January 1951. 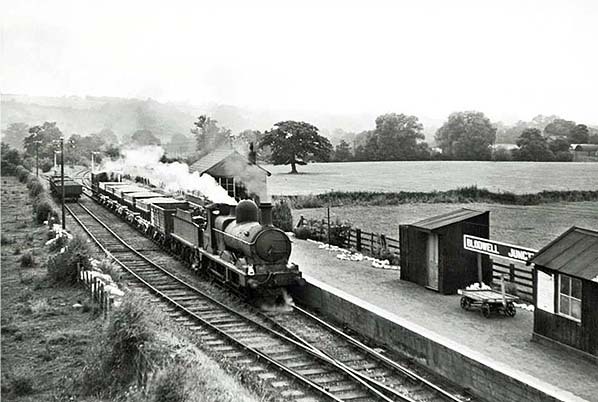 Goods services continued to run through to Llangynog until 1 July 1952 after which the line was cut back to Llanrhaiadr. Trains from a local quarry continued to use the remaining section of the Nantmawr branch as far as Blodwell Junction from where they then travelled via Llynclys Junction. The 1956 Handbook of Stations listed Blodwell Junction as being able to handle goods, parcels and miscellaneous traffic. In December 1960 flood damage to a bridge west of Llangedwyn led to the closure of the line west of Blodwell Junction. On 1 January 1963 Blodwell Junction came under the operational control of British Railways [London Midland Region] (BR[LMR]) and on 6 January 1964 the station closed to public goods services. Stone traffic from Nantmawr ceased on 21 October 1971. The last train was hauled by Sulzer Type 2 locomotive (later class 24) No.5048. Stone from Llanddu quarry continued to be moved by rail and trucks were shunted at Blodwell Junction. In 1985 a new loop was laid between the Blodwell Junction station goods siding site and the Llanddu quarry. 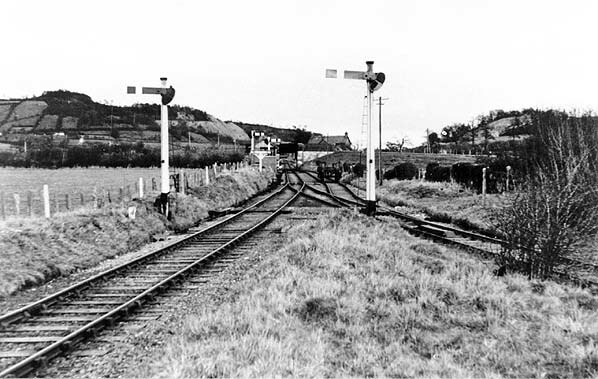 Buffer stops were erected at the A495 bridge which became the end of the line. All traces of the station had been swept away by that time. Quarry traffic continued to run until 1989. In 2004 the Cambrian Railway Society bought the line from British Rail Property Board and work began on clearing away vegetation. In 2009 the Cambrian Heritage Railways (put in link) was formed to bring together two groups (the Cambrian Railway Society being one) with the aim of reopening the line from Blodwell Junction to Oswestry. A view of the station looking north-east in 1903 during the period when it was closed. The station had closed as Llanyblodwel on 22 June 1880 but within a few months of this view being taken it would reopen as Blodwell Junction. The station shown on a 1:2,500 scale map from 1876. The passenger platform is on the west side of the bridge (left) and the goods facilities which include a weighing machine are to the east of it (right). Blodwell Junction station shown on a six-inch scale map from 1884 when it was still called Llanyblodwel and there was no junction at that location. Blodwell Junction station and the Nantmawr branch shown on a Railway Clearing House map from 1915. The Nantmawr branch is shown coloured green. Coloured in orange is the Tanat Valley Light Railway the opening of which in 1904 created the Junctions at Blodwell. Blodwell Junction station shown on a six-inch scale map from 1949. Blodwell Junction seen in late 1903. Refurbishment work is being carried out ready for the opening of the Tanat Valley Light Railway. The platform edge has been rebuilt from timber replacing the decayed brick face seen in the photo at the top of the page. 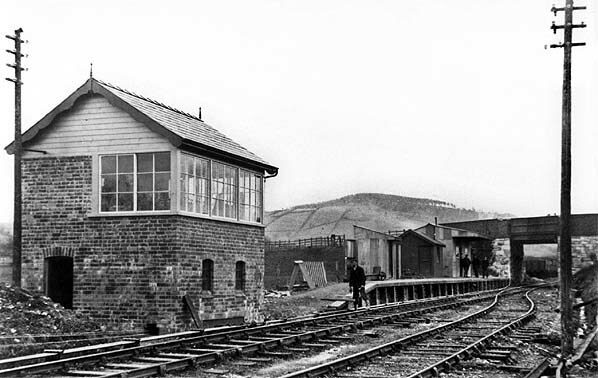 A signal box had also been built to control the soon to be commissioned junction. 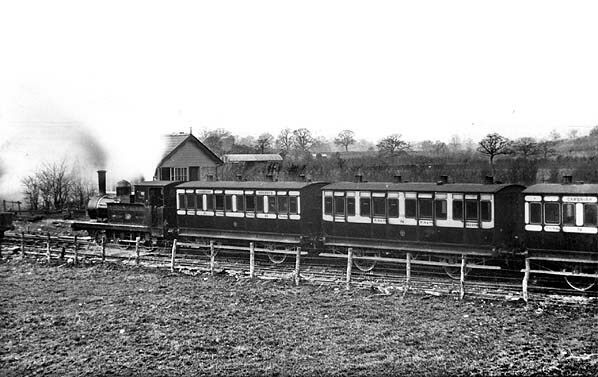 An Oswestry to Llangynog train is seen at Blodwell Junction in the early months of 1904. The Tanat Valley Light Railway was worked by the Cambrian Railways company and it is one of their engines that can be seen at the head of the train. Blodwell Junction looking west in the 1930s during the Great Western Railway era. The platform edge had been rebuilt yet again this time in concrete. A view looking north-east towards Blodwell Junction station in 1948. The station can be seen in the distance. The line to the left is the Tanat Valley Light Railway that ran to Llangynog. The line to the right is the Nantmawr branch to Llanymynech. Looking south-west along the platform at Blodwell Junction in 1957 during a period of flood. Blodwell Junction station looking north-east on 4 November 1979. Lookning south-west at the site of Blodwell Junction station on 25 June 2016 from the road overbridge. the fork of the junction between the Llanymynech and the Llangynog can be seen in the distance.